Step aside, Tesla. The Chevy Bolt has made a move to steal headlines in the electric-car market with the first affordable EV to break the 200-mile range barrier. What you’ll like: 238-mile-plus range, instant torque, cool graphic interface, paddle shifter for extra regeneration, tax breaks. What you won’t like: Tight driving position, long recharge times, limited cargo storage, some hard interior plastics. Favorite feature: Zooms from zero to 60 mph in under seven seconds. 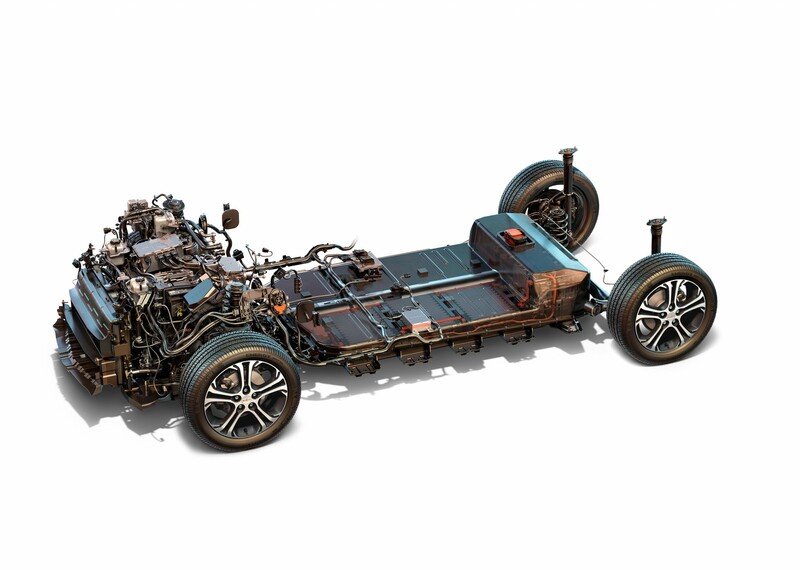 Service and maintenance costs: Low, compared with gas-driven cars. Battery warranty: 8 years/100,000 miles. Competing vehicles: When it comes to cost and range, nothing (until the Tesla Model 3 comes out in late 2017 — maybe). Fuel economy: 119 mpg equivalent (FuelEconomy.gov). The second wave of plug-in electric cars has landed, and the Bolt is leading the charge with a best-in-class range of 238 miles. Combine that with its $37,495 price tag ($29,995 after a $7,500 federal tax credit) and carpool lane access in many states, and the Bolt will likely appeal to more mainstream buyers. General Motors “was said to have killed the electric car — now I hope they give us credit for bringing it back to life,” says Michael Bradley, fleet internet manager for Selman Chevrolet in Orange, California, referring to the popular 2006 documentary “Who Killed the Electric Car?” The first Bolts were delivered to Selman and other dealerships in Oregon and California in December, and most if not all are spoken for; the vehicle will roll out more broadly as 2017 progresses. That gives it a jump on Tesla. That company has long been flogging promises of the Model 3, which will start at $35,000. Per the company’s website, production is slated to begin in mid-2017 — though Tesla is already taking deposits. It will offer only 215 miles of range. Base prices on current Tesla models (which all top 200 miles in range) are at the luxury end of the scale, starting at around $68,000. Until now, most affordable electric vehicles offered only 100 miles of range and, as such, were considered errand runners and commuter cars. But breaking the 200-mile barrier opens new horizons for the EV owner who wants to make round-trip drives from Los Angeles to San Diego or Santa Barbara. 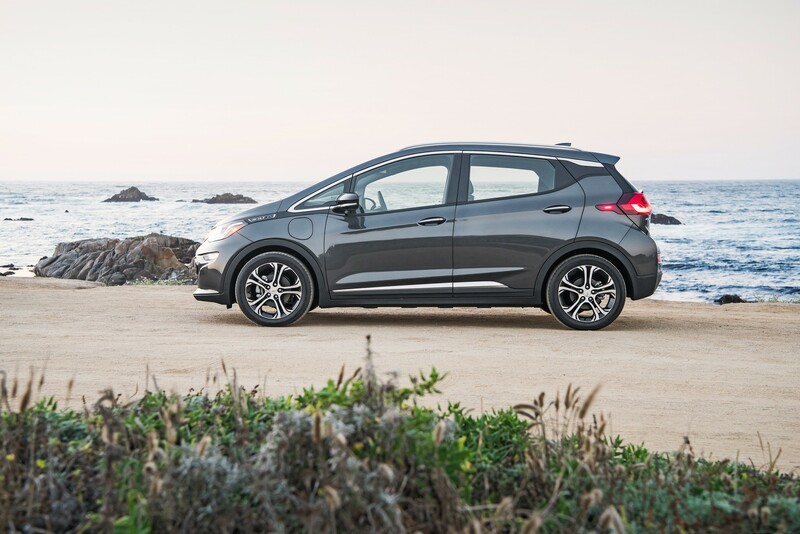 The Chevy Bolt has raised the bar for electric cars. When other soon-to-be-redesigned EVs are launched — such as the Nissan Leaf, Kia Soul EV and Volkswagen e-Golf — they’ll have to match that number if they want to stay in the game. Put another way, 200 is the new 100. The Bolt can be recharged on household current (110 to 120 volts). But for faster recharges, owners may want to install a 240-volt home charger, costing between $500 and $1,000 and providing an estimated 25 miles of range for every hour of charging. 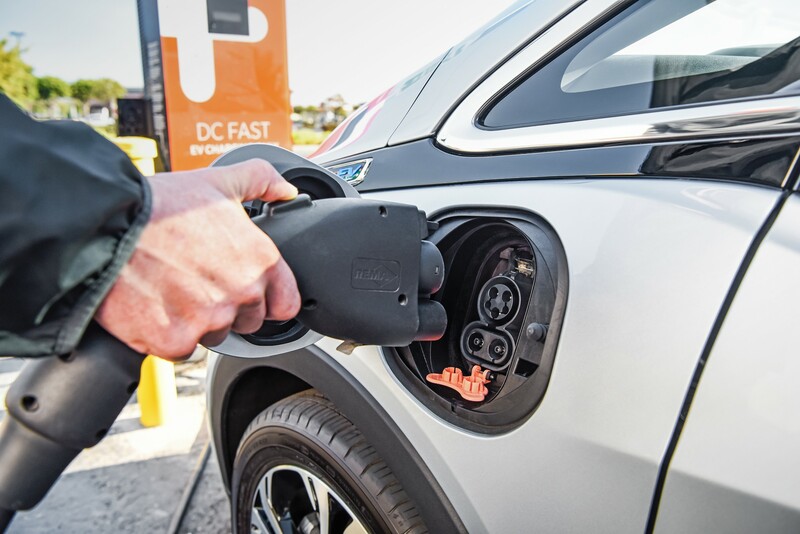 With the optional DC Fast Charging connection, the Bolt would add about 90 miles of range in 30 minutes. Although recharge times are important, most EV owners plug in when they arrive home and leave them charging overnight to take advantage of reduced electricity rates. Furthermore, recharging never begins on empty because most EV drivers arrive home with a partial charge. 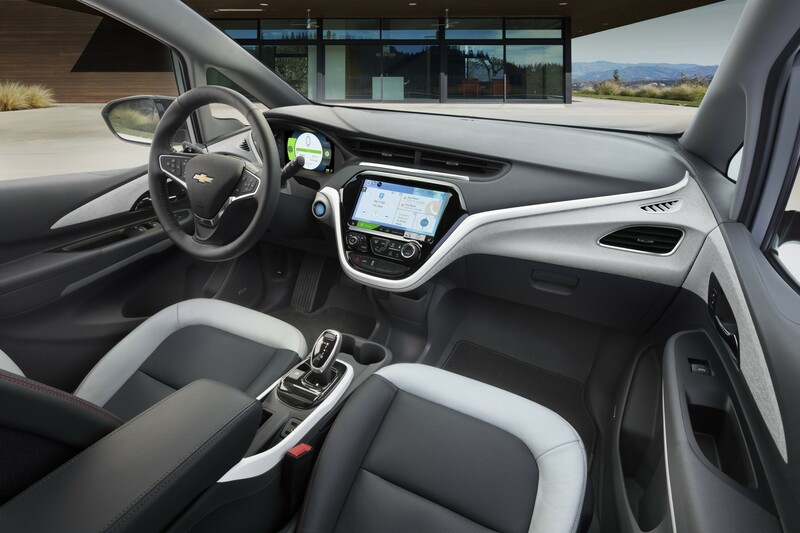 Chevrolet says the Bolt accelerates from 0 to 60 mph in less than 6.5 seconds and, on a short test drive provided by Selman Chevrolet, the power delivery feels instantly responsive — and very different from driving a gas car. The Bolt packs a 200-horsepower, 150-kilowatt motor and is nearly silent, with none of the whining or buzzing noises heard while driving other EVs. Because the lithium-ion battery pack is mounted under the car, the Bolt hugs the road on tight corners. 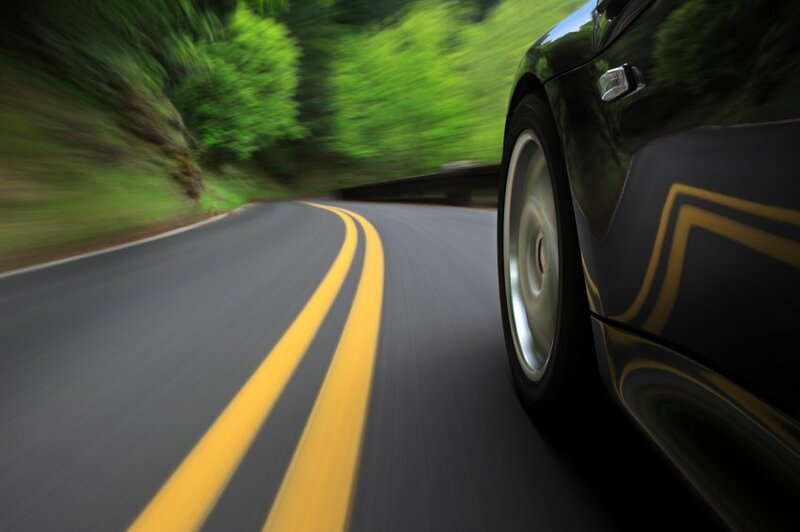 Drivers find the combination of a silent motor and instant torque to be a pleasurable mix. The Bolt comes in two trim levels, the LT and the more upscale Premier edition with leather seating. The Bolt offers the latest safety equipment as an option in the LT trim, including blind spot monitoring, rear cross-traffic alert and rear park assist. The Premier trim includes “surround vision” as standard equipment, using four cameras, and an option package that includes forward collision avoidance, lane centering and front pedestrian braking. 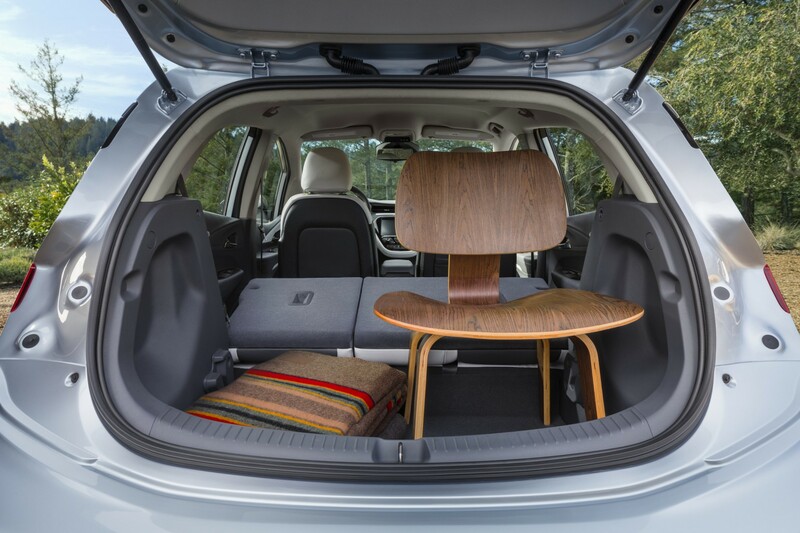 Although the car’s footprint is small, the fold-flat seats increase the versatile cargo area. The Bolt’s interior is a radical departure from most cars, with an iPad-sized screen in the center of the dash that will display navigation from your smartphone. Cup holders and storage spaces are cleverly carved into the doors and center console, but some of the plastics are hard to the touch. 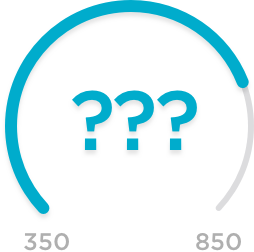 The graphics on the digital speedometer are designed with a pleasing sense of simplicity, conveying information without overwhelming the driver. The heating and air conditioning controls are logically laid out and easy to use. The driver’s seat was agreeable, except the center armrest was positioned uncomfortably, which might be a problem for larger people. The back-seat legroom was limited, and the rear cargo space was deep but narrow. Another perk for electric-car drivers is entry into the carpool lane, a time saver and frustration reducer. Several states allow EV drivers to enter the high occupancy vehicle lanes, according to the U.S. Department of Energy. For those who see time as money, this is an attractive benefit. EV owners also will discover that the cost of charging a battery is much less than filling a gas tank. The EPA rates the fuel efficiency of the Bolt at the equivalent of 128 mpg city and 110 highway. Nissan, VW and Tesla will soon launch redesigned or upgraded electric cars, so keep an eye on the market for news of upcoming models and release dates. Add in the cost of buying a charging station, or make sure you can get by on slower charging at available household current. And remember that pricing an EV is a matter of researching all tax credits, deductions and rebates. 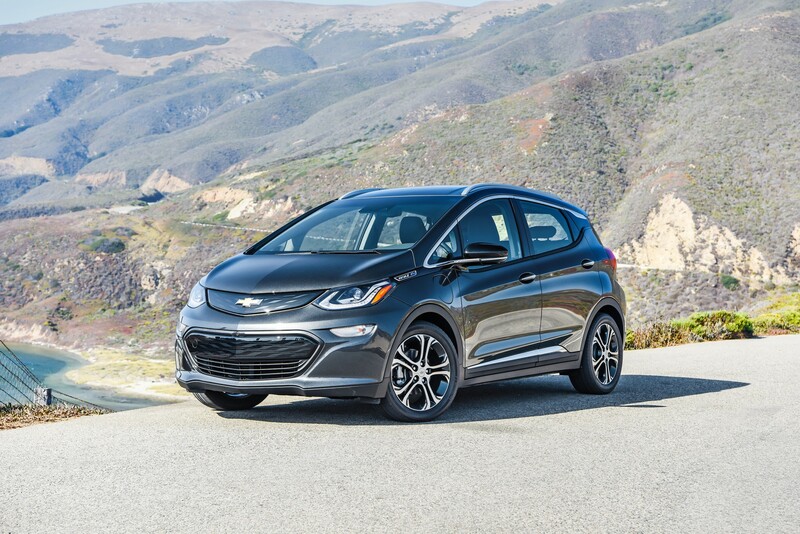 Because EV technology is rapidly evolving, leasing is advisable for the Bolt. If you’re interested in getting a Bolt early in the game, contact your local Chevrolet dealers and get the names of salespeople who will be handling the Bolt. Find out how you can reserve one and ask about pricing, which can vary widely from one dealership to the next. Early arrivals will be sold for full sticker price. Waiting even a few months could cut the price.